Enjoy a memorable evening with Shri Atul Purohit & group Rutambara performing LIVE in Perth Australia. Indu Patel An International Singing Diva, an absolute power to reckon with… The Girl with the Golden Male & Female Voice. Indu Patel Star of Kheda district, Indu patel has been performing Garba from long time now with fans across India, US, UK and now again coming to Australia. Brining you second time in Australia, all the way from Nadiad, Guajrat – Indu Patel. Sweet and Alluring, with a charismatic personality, the Lady with the Beautiful smile creates chaos wherever she goes… Indu comes alive on stage with her mesmerizing performance, be it HOLLYWOOD or BOLLYWOOD leaving a permanent impression on the minds of her ever increasing millions of fans all over the world! Indu Patel sings in Male & Female voice spanning the voices of 14 legendary singers including Kishore Kumar and Mohammed Rafi. 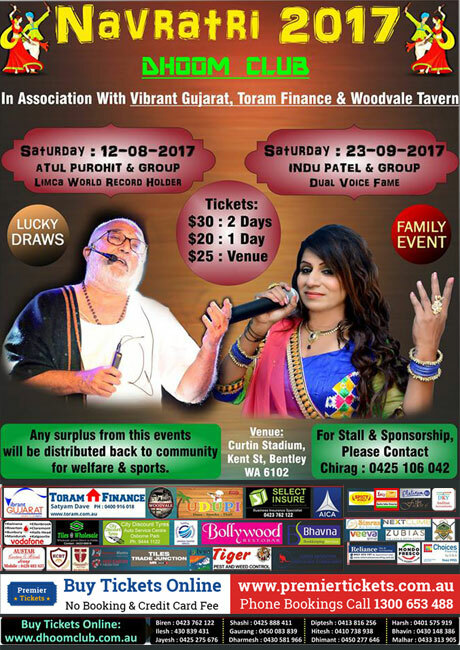 Enjoy a memorable evening with Indu Patel & Group performing LIVE in Perth Australia. Exposure to over 10,000 individuals from the subcontinent through print, email, social, web advertising and venue marketing. Sustained Exposure, DHOOM CLUB will be advertising the event from June 2017 all the way to end of September 2017. This gives our sponsors a significant duration of sustained exposure in the market. DHOOM CLUB is building a great reputation amongst sponsors and the various communities in Perth and therefore you will be in safe hands. Value for Money as at a fraction of the cost of creating and releasing an advertising campaign, you can promote your business as a sponsor in a very cost effective way. Regular functions and events like Family Fun day, Sports Tournament, New Year Celebration, Navratri, Kite Festival, Drama. Major Flagship events like Navratri – a dance festival with approximate attendance of more than 4000 people over two days. Guajarati’s are entrepreneur by nature. This event once again presents an enormous marketing opportunity for your brand and business. Your sponsorship and support for our current and future projects gives you the chance to leverage this rare brand awareness and product exposure opportunity. DHOOM CLUB offers flexible sponsorship options to align with your current marketing strategy and can customise packages to suit your marketing budget. Premier Tickets is Australia’s leading online event ticketing & marketing solution provider. We act as a channel between the event organizers and end customers helping our clients with hassle free event ticket booking, event marketing & promotion solutions. Contact us for any of your ticketing & marketing needs for Garba & Dandiya with Atul Purohit in Perth.